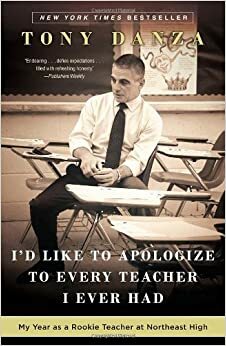 I just completed Tony Danza’s memoir I’d Like to Apologize to Every Teacher I Ever Had. I’m not going to lie, part of me felt cheesy about reading a book by Tony Danza (of all people) about his one year as a teacher. But, as a teacher, I can certainly respect Tony for stepping into my shoes not for a week, a month, or even a semester, but an entire school year. Its one thing to talk about being empathetic to teachers, but its a completely different thing to have the courage to live out what it means to be a teacher in America. His experiences as a high school teacher were turned into a series on A&E, which I have yet to watch. Reading his thoughts, struggles, euphoric highs, and emotional devotion to his students is something I, and most teachers, can absolutely relate to. On nearly every page, I couldn’t help but to say to my myself: “Oh yeah, yep, I know exactly what he’s going through.” In this respect, there was nothing really new or surprising in the book – especially since I have taught in an inner-city high school for nine years. The first thing that struck me was how Tony vehemently opposed a staged, dramatized depiction of his experiences that was “good for T.V.” I’m with him. With everything that needs to happen for student success, the last thing my class needs is a camera crew filming our every move. We have work to do. I found his stripped-down account of the school year a strong reminder of the immense work that I do. After all these years, I sometimes forget actually how much “work” I do on behalf of my students. I put the word work in quotations because I still don’t really consider what I do as work in terms of what others consider work to be. I’m helping students succeed – to me that’ll never really be work. Nonetheless, I take much of what I do for granted simply because I have been doing it for so long. Teaching (and teaching students that are classified as high need especially) is hard. Tony learned for himself. It was helpful to get Tony’s fresh point of view on my daily grind. This was where my first takeaway from the book comes from. It reminded me that my commitment to my students can be overwhelmingly extensive, but it is incredibly vital. I can tell you that this will make me even more vigilant and persistent with my students. Bob DeBitetto, who was the head of A&E network at the time of filming, mentioned that he picked up Tony’s show because it was a “good cause, topical” and that he “might get lucky” with ratings. Tony pointed out that this attitude pretty much summarizes America’s perspective towards public education as a whole. I would say that there’s some truth in that sentiment. Tony had a production crew with him for a good part of the school year and struggled with this because he refused to make good television. Apparently, there wasn’t enough drama. That’s crazy. There’s too much drama in an inner city high school; thats the problem. But, because I’m inside the box, I’m inherently ignorant to how America views what I do. This was the second takeaway from Tony’s book. It helped to inform me exactly how my country views my profession. I now have a more holistic perspective on myself and my students, which isn’t all that reassuring. This entry was posted in reflection and tagged book, reading by brian. Bookmark the permalink.